On how the cardiothoracic surgeon ended up becoming the comedic conscience of Egypt. 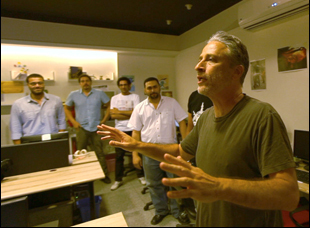 When Dr. Bassem Youssef came to the set of “The Daily Show with Jon Stewart” in 2012, Sara Taksler, then a segment producer on the show, had become fascinated with the Egyptian cardio thoracic surgeon who had thrust himself into Tahrir Square during the revolution of 2011 to treat those injured and found that his brilliant sense of humor that put patients at ease could be applied elsewhere to heal, namely a satirical webcast that could shed light on the tyranny of then-President Hosni Mubarak. What Taksler had in mind was bigger than what she could do as part of her day job, but having gone through the arduous process of making a documentary already with the unforgettable 2007 profile of balloon artisans “Twisted: A Balloonamentary,” she had reservations about taking on a project that big again. Still, Youssef was only in New York for a short time before going back home to Cairo, so she didn’t have much time to put a pitch together. And it took even less time for Youssef to agree. Much as some in the Egyptian government might wish that would be possible, Taksler caught lightning in a bottle with “Tickling Giants,” which chronicles Youssef’s rise as the comedic conscience of a country under siege, as well as the machinations that led to being exiled. Still, in preserving a record of the production of Youssef’s variety show “Al-Bernameg (The Show)” over the course of three years, “Tickling Giants” has ensured that what Youssef achieved can never be erased and in fact will be amplified globally as the creep of totalitarianism appears to be on the rise around the world. With piercing blue eyes and an even sharper wit, Youssef proves to be an ideal movie star and an exemplar of grace under pressure, even as three different Presidents in Mubarak, Mohamed Morsi and Abdel Fattah el-Sisi attempt to undermine his ability to bring his show to the public. Yet Taksler goes beyond his incredible personal story to take in the full sweep of what he and friend Tarek ElKazzaz accomplished after brainstorming in the weeks following the Arab Spring an alternative to what they were seeing on state-controlled TV that was more in line with what they were experiencing in reality. The Show, whose viewership immediately swelled to millions first online and then on television, not only used comedy to shed light on various abuses of power at a particularly fraught moment, but empowered viewers and its own staff, who had an infrastructure to find their voice professionally, to articulate what they were feeling. As the film makes its way to theaters around the country following its debut last spring at the Tribeca Film Festival, Youssef and Taksler shared what the films means now to them, as well as making a film that grew in scale dramatically after its conception and the incredible story of how Technicolor gave the film a big boost in post-production. Was it an easy decision on both ends to start making this film? Bassem Youssef: Wouldn’t you say yes if somebody said like a documentary on you? Yeah, sure. Why not? None of us thought that this would unfold so much. We just thought that this would be a documentary about the experience. I thought it was important that we would have the documentation of the first-ever live show. Sara Taksler: I had the idea it could be an interesting story and the whole day I was on Instant Messenger with a friend at work saying should I ask if I should do a movie? Do I get myself into this? Is it too much work? And I asked this friend if he would go to Egypt with me, and he was like, “No, you’re on your own.” [laughs] So I debated it and the day was ending. [As] they were leaving, I was like I’ll kick myself if I let this opportunity pass, so I just went up to [Bassem] and said, “I have this idea that this could be an interesting documentary. Would you be open to it?” I think it was a four-minute conversation probably. Bassem Youssef: I also wanted her to teach me how to make balloon animals. Sara Taksler: Yes, which I did. He’s a good student. Given your behind-the-scenes experience with “The Daily Show,” what was important to show about the production of a show like this? Sara Taksler: What drew me to the story, honestly, was far less about Egypt and more just about using satire and high stakes. That was very interesting to me. And Bassem’s team did the same thing I do at work, but with much higher stakes than I’ve ever had to deal with, so I was interested in how physically they do that. There were certain things that I found interesting, but didn’t necessarily make it into the cut, in terms of logistics. It’s so much harder to do a show when you don’t have all of the technical assets that you have in the U.S. because there’s so many people doing the same type of thing. [At “The Show”], they had to watch and transcribe every single show [whereas] there are news services in the U.S. to make the process easier. Their daily production was just much harder than any show in the U.S. would be. You were able to tell the story of Egypt over this time through “The Show,” but was it difficult to balance what was going on inside versus what was going on outside? Sara Taksler: Yeah, I had to decide who the audience was because all the test screenings that we did, it was either too much information for Western audiences to take it all in or it was too little to understand the details of who was who. Or for Middle Eastern and specifically Egyptian audiences, it would be too much information — too much backstory — or it would be why didn’t you include this detail about this event that felt so important, so I had to figure out which audience I was gearing it towards because both audiences would have a hard time feeling equal. I decided I’m never going to tell the best Egyptian story [because] I’m not Egyptian and there are details and nuances that I’m never going to be the best storyteller for. But I’ve been working in satire for about 15 years and hopefully in that time I’ve picked up enough in that time to tell the story of a guy who used to do something else and decides to be a comedian and becomes one of the most famous comedians in the world and that story, was for me, more intriguing. So I like to think of it as a Cinderella story gone awry about this guy becoming a comedian and it happens to take place with the backdrop of the Arab Spring, which makes the stakes very high. For Bassem, it was interesting to see what was going on around you at a remove? Bassem Youssef: Yeah, because watching this as a viewer now, it brings back memories. It actually shows me in a state that I didn’t know I was in — how my personality was changing on stage and offstage and how to deal with the stress of being under pressure from all kinds of media and political situations. We had to just go and crack jokes and [this shows] the mood swings that we had, the masks that we had to wear [that were] extremely exhausting. I just wonder how we got through it. How did the idea of filming the public watch parties came about? Sara Taksler: The story of Bassem’s show would be incomplete without mentioning it was a very public, shared experience. It wasn’t just a TV show that you’d watch getting into bed, and flipping it on at night. People would literally gather in the streets and watch “The Show.” One of the coolest things about the show was that it wasn’t just an internal experience. It was a shared experience with other people who were either loving the show or hating the show, and they were reacting to it as a group. I’ve heard of that for sporting events, but I had never seen that anywhere for comedy. That felt very special where people are laughing and having a dialogue about the events of the week and it was a cool, unique thing that they had the equivalent of the Super Bowl every week with people just watching and talking about comedy in this case. Bassem Youssef: Because we didn’t have a lot of competition, we wanted to give something for people to speak about for the rest of the week, so we wanted this one thing to have everything in it – musical [numbers] and dancing and sketches — it was a mixture of “Daily Show,” “SNL” and whatever musical shows there are. You check in from time to time with a young man named Andeel, who also originated the film’s cartoon interstitials and eventually works for “The Show,” but how did he come to your attention? Sara Taksler: I first became interested in talking to Andeel because he was pretty vocal as a revolutionary, but he’s just a unique guy. For example in the election, a lot of people didn’t vote because they felt, “My vote doesn’t matter,” and Andeel was like, “No, we’re in a democracy. I’m going to vote.” He had just a unique voice in a lot of situations and I was looking for the way to express [the idea of] “Tickling Giants” in a few different ways. [There’s] the comedy of “The Show” where people are singing in the office and I liked the idea of having a visual way of showing creative nonviolent ways of addressing the abuse of power. So Andeel said he was a political cartoonist and I described to him what I thought the movie was about and he drew this picture of the little Bassem with this giant foot, about to either crush him or maybe laugh. We don’t know. And I was like, “Oh, that’s what the story is.” After that, I thought maybe we should call this “Tickling Giants,” so I started to talk to Andeel more and more and for me, it became Bassem was the story of what was currently happening and Andeel was the story of the next generation and what the future will be, because even if Bassem can’t be in Egypt anymore telling jokes and doing political satire, Andeel is still there. He’s still a political cartoonist and he’s still challenging authority and I like the idea of a torch being passed on – that the importance of what people got out of “The Show” still continues. It sounded like there were several times where you thought you might end filming – did the decision to keep going on continue to make itself naturally? Sara Taksler: Yeah, “The Show” had nine lives. I kept thinking it was over and when “The Show” was coming back on a new network after it had been canceled the first time, I thought “Oh, we’ve got a good, triumphant, happy ending” and I went to Egypt to film that week and it looked like things weren’t going to go in that direction, so it became clear we had to keep filming. One of the people I was working with, the director of photography [Wail Gzoly] said to me, “The trick will be to tell the story through Sisi becoming President” because he was confident that Sisi would become president and he was like, then we’ll see what the real story is behind “The Show” [as] something that will last in Egypt. Or did it all exist in a bubble? He was exactly right. A minute after Sisi was president, “The Show” was off the air. If nothing had changed, I’m sure the edit would’ve been different, but at that point, the story of “The Show” was over and it’s not that other things won’t live on and come out of the Show, but our story in the movie felt like it was at a natural ending. Is it meaningful to have this as a time capsule? It can’t be erased. Bassem Youssef: Of course, because on a public level, it gives people an idea of what happened there. On a personal level, that’s my diary. That’s what I can show my kids to let them know your father wasn’t a jerk all his life. [laughs] He was cool at a certain point. You can’t help but notice at the start that Technicolor has an executive producer credit on the film, which I don’t believe I’ve ever seen before. How did they get involved? Sara Taksler: I won a contest I didn’t enter. During the course of the filming, we didn’t share on social media at all that filming was taking place, just out of an abundance of caution. We had a camera person who was beaten up for his footage and didn’t want to increase the risk for the crew. We were self-funding the whole time and at the end of filming, I started an IndieGoGo campaign and I shared the IndieGoGo page with everyone I knew and a lot of them passed it on. A friend of a friend forwarded the trailer to everyone she knew, including a woman that she had gone on a service tour with for Save the Children, so she knew this woman in a service-oriented context and the lady was sitting at her computer and watched the trailer and got up to do something else and left the trailer on the screen. When her husband just sat down to check his e-mail, he just clicked on the trailer and watched it and loved it. He happened to be the CEO of Technicolor. And I got a message the next day that he wanted to speak to me. It was right after Charlie Hebdo, and Technicolor is a French-American company, so the story really resonated with them and they were really curious in exploring comedy in the Middle East. They contacted me and told me they wanted to executive produce the film and they ended up covering the whole post-production of the film and the animation. It just raised the levels of the film to things I never could have done on my own with the budget we were working with. I was going to edit the film on a card table in my living room and now we had 10 full-time employees. It became a huge project and Technicolor made all of that happen. What’s it been like traveling with the film? 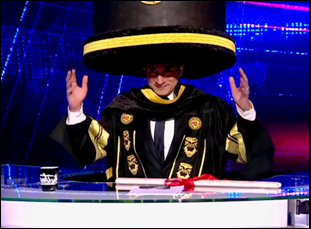 Bassem Youssef: Oh, it’s amazing. It’s a totally different experience when you watch the movie with people. I cannot watch the movie. Emotionally, it’s quite difficult for me, but even if you’re outside and you can hear the people react, clap and laugh in a movie and get engaged in a documentary – a feature movie, it makes me proud to be a subject of a great movie that Sara directed. Sara Taksler: I love it. Usually in my life when there’s something very big going on, I’m just stressed out and I can’t wait for it to be over, but honestly, I’m just enjoying every step of this. It’s good that it took a little bit for the opportunity to have the movie be seen by audiences [because] in a weird way, Trump’s election has helped the film. U.S. distributors are realizing that this story is very relevant and because I had some time to rest after making the film, I now really love watching it with people and hearing the reactions and conversations that come up after the film. It makes me hopeful that people will figure out ways to be heard in creative ways. “Tickling Giants” is now open in New York at the IFC Center and Los Angeles at the Laemmle Music Hall. Interview: Joseph Cedar on Scheming His Way Into the Head of "Norman"